Map revealing the last days of the Barbary Corsairs. Carte de la Barbarie contenant L'Empire de Maroc et Les Regences D'Alger, De Tunis et de Tripoli. 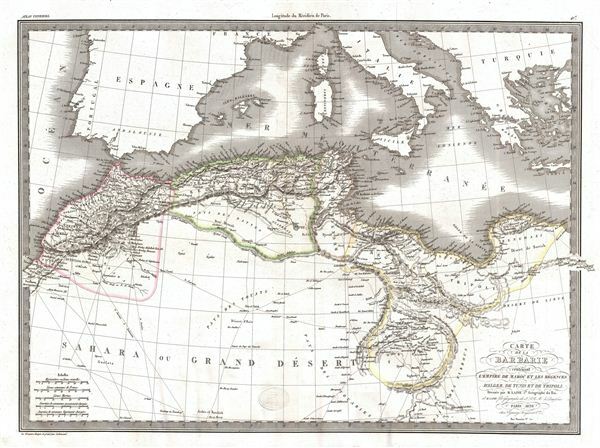 A fine first edition example of M. Lapie's 1830 map of the Barbary Coast. This map covers western Mediterranean Coast of Africa from Morocco to Benghazi, including modern day Morocco, Algeria, Tunisia, and Libya. Long a hotbed of piracy and a center for the Slave trade, the Barbary coast, including the Maghreb, was being conquered by France as this map was drawn. Frances tenuous conquest of Tunisia and Algeria in 1830 finally ended the threat of the Barbary Corsairs. This map was engraved by Armand Joseph Lallemand as plate no. 041 in the first edition of M. Lapie's important Atlas Universel. This map, like all maps from the Atlas Universel features an embossed stamp from the Lapie firm. Rumsey 2174.041. Phillips (Atlases) 754, 765.